No game is guaranteed to become an eSport. No amount of money or marketing could have plonked League or Hearthstone where they are now if their quality and potential hadn’t ignited that groundswell enthusiasm. But if you live and work in California, there are certain good omens to look out for. 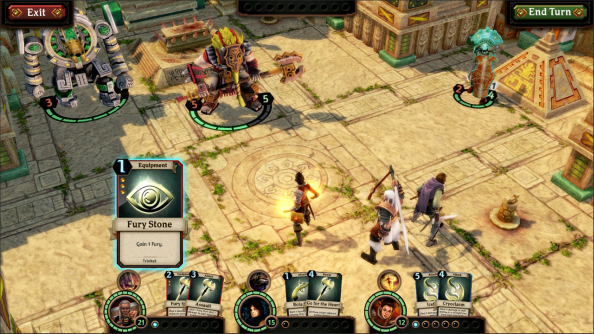 Free Range’s fan at Riot pulled together the necessary investors, and the company have since partnered with Justin Gary, the pro Magic: The Gathering player behind CCG outfit Stone Blade Entertainment. “Marketing muscle”, meanwhile, comes from Robert Kirkman’s Skybound – determined to “make this thing huge”. Here’s what Scholz means: while Labyrinth is a game of deckbuilding, it’s played from an isometric perspective not dissimilar to XCOM’s. 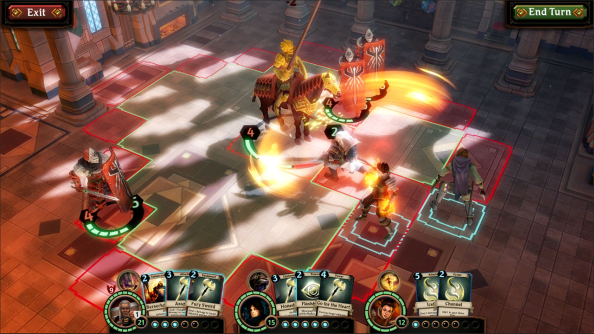 Players can fiddle with the positioning of their party of three, launching assaults and doubling back. The decks their adventurers take into a dungeon determine the attacks they’ll be able to make, with each individual card representing the slash of a sword or heft of a plate of armour. 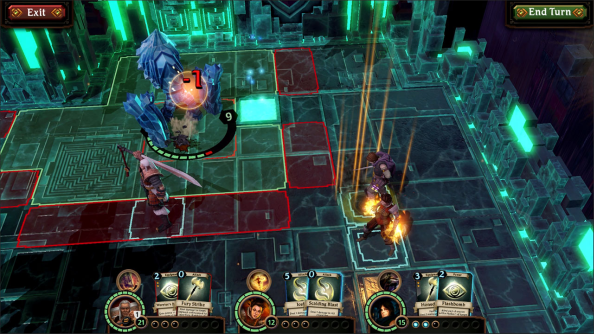 In that respect Scholz’s talk of a “new category of games” isn’t strictly spot-on – on the surface Labyrinth’s CCG-infused dance of the grids isn’t spectacularly different from that of Card Hunter. Those dungeons, however, are also under player control. 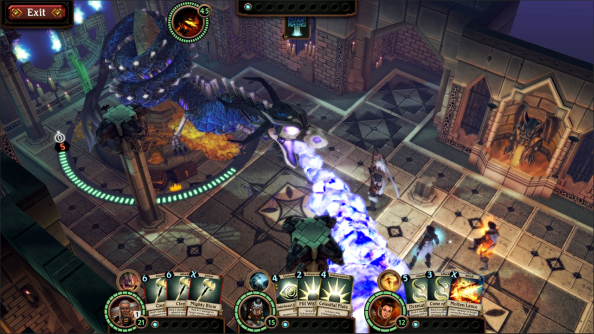 Deck builders will set up three bosses for invading adventurers to fight in sequence. They’ll log off, or perhaps disappear to fight their own raids, and come back later to see how other players have fared against the AI minotaurs they’ve equipped (“I really wanted to have the feeling the game’s alive when you’re not playing it,” says creative director Brad Fulton.). This system would appear to leave Labyrinth dungeon keeping the purest CCG of all: one in which nothing so inelegant as play is necessary; a card game entirely dedicated to high-level number-crunching. If you remember, there was a similar dungeon defence conceit at work in Ubisoft Montreal’s Mighty Quest for Epic Loot. This attempt, however, had a problem: battles were balanced such that invading players got to win the majority of the time. As a dungeon keeper, it felt as if you were logging in every day to find broken glass everywhere – your castle broken into and gold stores ransacked. It wasn’t much fun. Scholz points out that each raid is a three-stage affair, and that dampens the frustration often felt by Hearthstone players – who by design lose half the time. Succumb to your enemies in the second or third battle and you’re still celebrating a small victory and a modest haul – as is the player who kitted out the bosses. So far, so clever. But by far the most exciting element of Labyrinth, the part that has Twitch tacticians doing amateur maths during streams, is the way it treats time. Magpied from partner Stone Blade’s WoW miniatures game, Labyrinth’s turn system places every character involved in a battle on a timeline. In place of an arbitrary resource like mana, Free Range have ticks – the amount of time an attack takes to complete. If a blademaster decides to make a slow swing, then she’ll pay for that in her position on the timeline. If a priestess plays her Fire of Life card, she won’t be able to act again until tick six. There’s nothing stopping players from pulling out their most powerful abilities from the off – but the best will always have an eye on a minotaur’s next move. They’ll make shrewd use of the thief class, who can run rings around an enemy, getting a couple of stabs in for every blow in return. 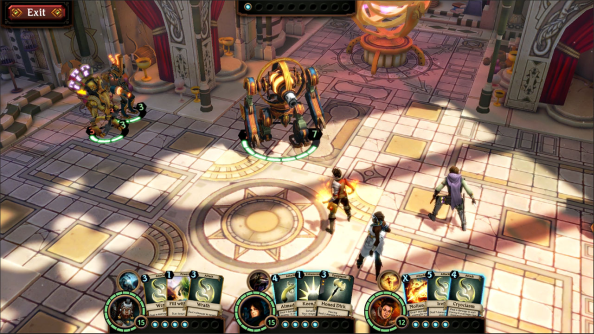 Eventually, Labyrinth will be a free-to-play entity in which players will win character classes and abilities through booster packs or card crafting. For now, it’s available at a fixed price in Early Access. For all their big-name backing, Free Range know they need that groundswell.